The Quilt Trails of Western NC has more than 200 quilt blocks making it the the largest concentration anywhere in the United States. 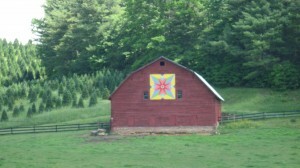 Six contiguous counties host quilt blocks, with the highest concentration in Yancey and Mitchell Counties. While in Yancey County, visit Mt. Mitchell, highest peak East of the Mississippi. Mitchell County is home to Roan Mountain (the rhododendrons are in full bloom in June – gateway through Bakersville) and Avery County offers Grandfather Mountain with its mile-high swinging bridge. Of course we have waterfalls, supreme hiking, great trout fishing, canoeing, golf, horseback riding, and great shopping. Burnsville, seat of Yancey County, has two quilt shops.